Brandon is an unincorporated community and census-designated place in Hillsborough County, Florida, United States. It is part of the Tampa–St. Petersburg–Clearwater Metropolitan Statistical Area. 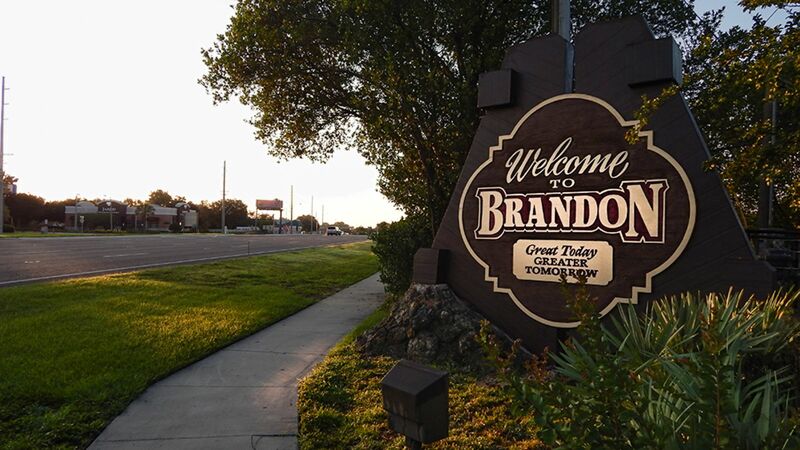 As of the 2010 census, the Brandon had a population of 103,483, up from 77,895 at the 2000 census. Brandon's history began on January 20, 1857, when John Brandon (1809–1886) arrived at Fort Brooke (now Tampa) from Mississippi with his first wife Martha (1813–1867) and six sons. At first he moved his family to what is now the Seffner area. Then in August 1858, John Brandon purchased 40 acres (160,000 m2) in the New Hope area (now Brandon) and 160 acres (0.65 km2) later on and then named his land "Brandon". John and his second wife Victoria's house was located on what would become the corner of Knights Avenue and Victoria Street. Four years later, the New Hope Church was built on land donated by Brandon. Besides being the first church in the community, it also served as Brandon's first school. Stowers Funeral Home is a famous landmark in Brandon, in a building erected by John Brandon's son James. At the time, Valrico began to develop to the east as Victoria's son Lovic moved there and opened a general store. Lovic and Victoria's other son, Mark, organized the Valrico Baptist Church in 1915, which later moved to Brandon and became the First Baptist Church in 1930. By 1914, the community needed a large central school to house all of the area's students, so the Brandon Grade School (now McLane Middle School) was built on Knights Avenue to house grades 1 through 12. The first Brandon census was taken in 1922 when the population was 100. In 1925, Hopewell Road became a 9-foot-wide (2.7 m) paved road, and residents such as Clarence Hampton began building businesses along it in 1927. Hampton opened the first gas and service station. During the 1920s, the eastern border of Brandon was Pinewood Avenue. Beyond that was the Kingsway Poultry Colony, where chickens were raised during the winter to be sold in Ybor City. During the Great Depression the poultry farms closed, until around 1946, when Bill and Ann Hollash moved to Brandon and started Brandon Egg (which became Hollash Eggs), the largest egg producers in eastern Hillsborough County. Hollash Eggs closed in the late 1990s. The original farm, over 30 acres (12 ha), was sold to what is now Bell Shoals Baptist Church. Most local residents worked in the two orange packing houses in Valrico. The center of town remained at Moon Avenue and Victoria Street, where the train depot, post office, school, and grocery store were all located. For entertainment and everything else, the train to Tampa was the way to go, as only a few paved roads existed, with most being dirt- or shell-topped, making the drive to Tampa very difficult. World War II was an interesting time in Brandon, with little growth, but a definite edge as they had the food they raised on their farms. After the war, new businesses began to open. A drug store and soda fountain at the corner of Parsons Avenue and Hopewell Road quickly became a popular teenage hangout. In 1950, Scogin's opened their famous variety store on Hopewell Road, and in 1953 Brandon got its first physician, Dr. V. R. Hunter. The 1950s were the beginning of the real growth period for Brandon. Yates Elementary was built in 1954, followed by Mann Junior High School in 1957. Brandon Grade School, on Knights Avenue, became the first Brandon High School. At the time, there were fewer than 100 graduates a year. In 1956, Hopewell Road was connected to Adamo Drive, which made access to Tampa easier, thus turning Brandon into a bedroom community. With commuters came subdivisions, the first of which was Hill-Dale Heights on Kingsway Avenue. The Brandon News was established in 1958 as a one-page newsletter and advertisement for Scogin's clothing store, written by Al & Chris Scogin. Brandon's first honorary mayor's race was held in 1959 and was won by Nat Storms. Updated:25th April, 2019 7:58 PM.